This figure demonstrates the organization process of a chromosome. Chromosome Droplets are formed during this process and act as a basic packaging unit of the chromosome. Their structures are maintained by the glassiness of the chromosome. In this image, the red and blue are repressive and active loci, respectively. Credit: The University of Texas at Austin. For years, scientists have looked at human chromosomes, and the DNA they carried, poring over the genetic code that makes up every cell for clues about everything from our eye color to congenital diseases. 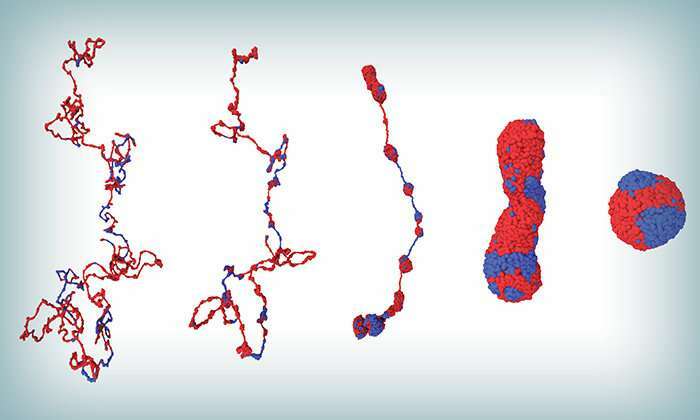 In a new study, however, scientists have demonstrated the movement of chromosomes within cells also may play a role in human traits and health. In a paper just published in Nature Communications, scientists at The University of Texas at Austin have mapped the movement of a chromosome, using computer modeling to show how billions of base pairs of DNA get packed into an impossibly small space without getting tangled. For the first time, they showed that the movement is sluggish and glass-like, differing from one cell type to the next and even among cells of the same type. Understanding this movement better could have big implications for the study of genetic diseases, human health and gene editing. "Rather than the structure, we chose to look at the dynamics to figure out not only how this huge amount of genetic information is packaged, but also how the various loci move," said Dave Thirumalai, chair of UT Austin's chemistry department. "We learned it is not just the genetic code you have to worry about. If the timing of the movement is off, you could end up with functional aberrations." Thirumalai, along with Guang Shi, lead author and graduate student at the University of Maryland, looked at how two distinct chromosomes move. 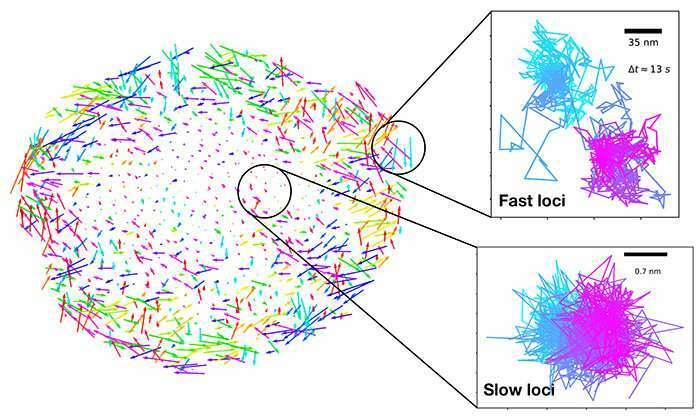 In a computer model, one chromosome starts out looking like an unrolled ball of yarn following replication. Slowly, the chromosome starts to fold in on itself. It forms chromosome droplets, like glassy beads strung on a necklace, before winding itself into a ball. The movement continues, even after the chromosome has reached this compact stage. 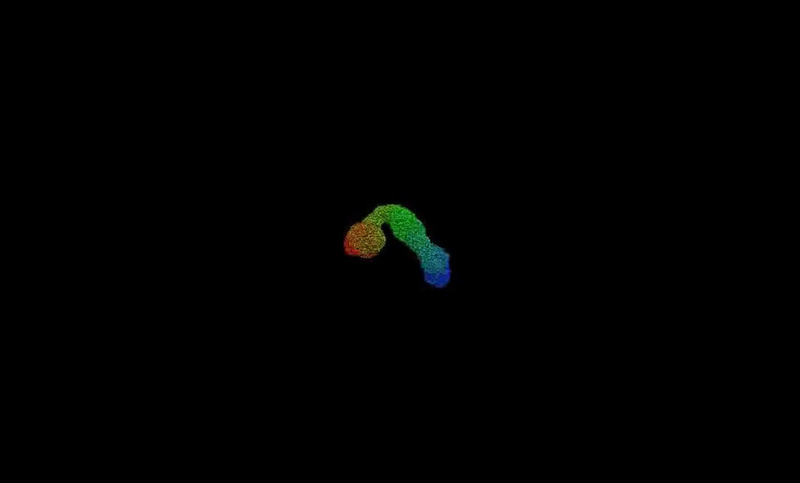 The video shows a time-lapse of chromosome 5 packaging itself. The different colors represent the genomic location of the loci. Credit: The University of Texas at Austin. "We found that the movement of the chromosomes was sluggish, reminiscent of glass-like behavior. We believe this might have profound consequences for how the cells behave both individually and collectively," said Shi. "In addition, different regions of the chromosome move at different speeds." The team chose to look at chromosomes 5 and 10, mapping how each moved. Genes found on chromosome 5 are associated with some forms of leukemia, Parkinson's disease and aspects of male infertility. Genes on chromosome 10 are associated with types of porphyria, a blood disease; glioblastoma, an aggressive brain cancer; and a type of congenital deafness. In the model, it was clear that the movement of each chromosome changed, depending on the cell. For example, chromosome 5 in one cell could move very differently, more slowly perhaps, than in another cell. Thirumalai suggests thinking of DNA like a book with a recipe for a human, where the piece of information you need is on page 264. Reading the code is easy. But we now understand that the book is moving through time and space. That can make it harder to find page 264. "Gene expression, one of the most important biological functions of cells, is a dynamic process rather than a static state," said Shi. "For every gene to be expressed in human cells, the distant regions of the chromosome must come into contact. When these dynamical processes are disrupted, cells may die due to the failure of expression of a few crucial genes or sometimes becomes a cancerous cell." This image shows both the 1) coherent motion and 2) heterogenous dynamics of loci. The main figure shows the displacement field of chromosome loci. The length and color of each arrow indicates the magnitude and direction of loci’s movements. It shows the coherent motion of different regions inside the chromosome. Two small figures show the typical trajectories taken by fast and slow loci whose mobility can be very different. These two small figures show the heterogeneity of individual loci’s dynamics. Credit: The University of Texas at Austin. How long it takes for chromosomes to meet, when they meet and how long they remain in contact—things that studies like this one reveal—may improve scientists' understanding of certain diseases, Shi said. The researchers hope to continue studying the dynamics of different types of chromosomes and exploring whether abnormal cells, like cancer cells, have different dynamics. Researchers with the Korea Institute for Advanced study also contributed to the research. Funding came from the National Science Foundation and the Collie-Welch Regents Chair at the University of Texas at Austin.